It’s a given developers know their products better than their users but this can lead to a gulf in understanding between them. Listening to user feedback and watching their behaviour in your app will ensure you spot problems and can quickly solve them. 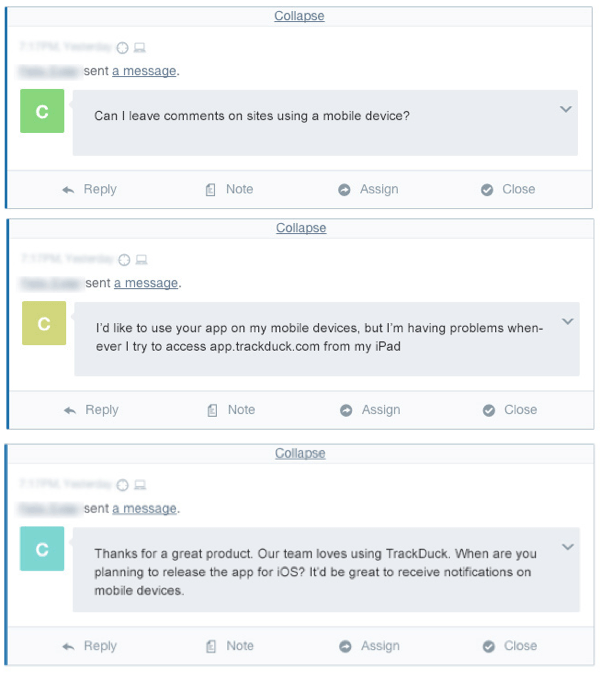 What follows is a guest post from Eddy Balcikonis, co-founder and CEO of TrackDuck, a feedback gathering tool for developers, which uses Intercom to connect with its customers. 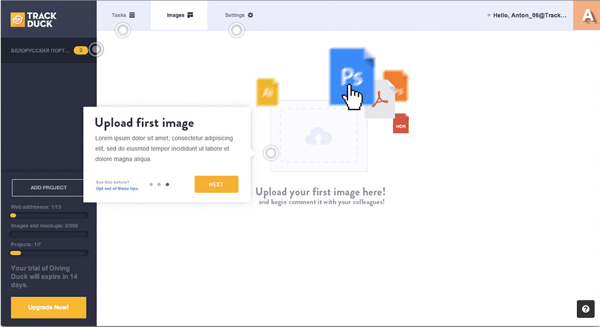 TrackDuck’s tool helps simplify the development process for web projects by allowing clients to easily give visual feedback to developers. Ensuring reliable communication and clear understanding between the customer and the contractor during the development process is at the core of what TrackDuck does. We have been working on the product for one and a half years, but it feels like the serious work has only just begun; like any good web application, it needs constant improvements. Our interface design is one area where we have got invaluable feedback from users, collected using Intercom. Here’s some of the lessons we have learned from this user research. When should you consider changing your existing interface? If you are working on an app for developers, be ready for a high bounce rate at the user registration stage. Converting a visitor into a customer is really difficult. To achieve this it’s essential that the visitor figures out how your app works in the first 3-5 minutes. We have lost a great deal of potential customers at this initial stage because they felt the forms were too difficult to complete. In response we added some training materials and simplified the process of creating the first project. We managed to transform the 10-step registration form, which required users to enter a lot of irrelevant info, into a simple four-step process with three entry fields. The effect: We’ve seen a 120% increase in the number of customers who have successfully completed the registration process and started using our system. We haven’t received any questions from users about the registration process since we made the change! After adding their first project some users did not go on to explore all the possibilities our app has to offer – we believed because they lacked the time. 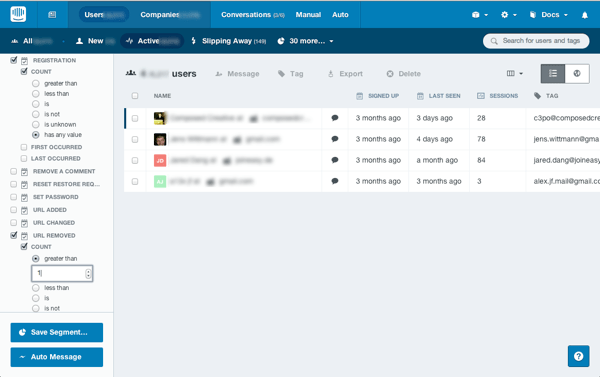 We track user activity in our app using Intercom. As a result we could see that there was a segment of new users who seemed to forget about our service without even trying to use it. To address this problem, we encouraged users to familiarize themselves with the capabilities of the app immediately after they’d completed registration. We developed and implemented onboarding for these just-registered users. It took them through a seven step tour of our most important features – starting with the task dashboard, app settings and then the TrackDuck toolbar for adding issues. We also set up Intercom auto-messages about some features, e.g. about our referral program, which was launched later and not included in onboarding. 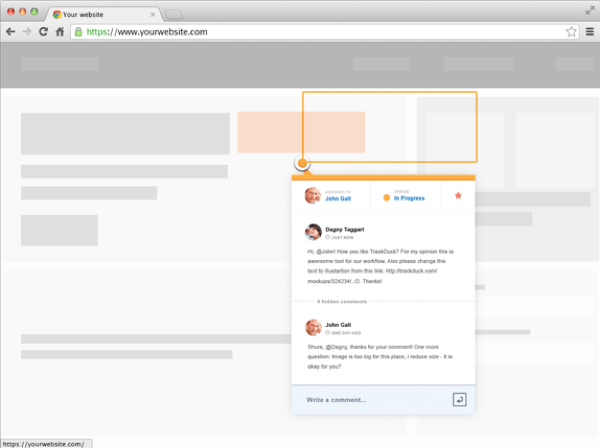 This helped a lot when analysing and responding to client queries – we could see if they went through onboarding or at which step they dropped off – enabling us to give better replies to their questions. The effect: Evaluation of our user activity gave us a deeper understanding of the types of problems they face when starting to use your app. Tracking relevant application events will give you an insight into not just how many users you are losing but how you might be able to avoid these losses. Developing individual applications for mobile platforms means additional expenditure for development and support of certain native applications for various platforms. Not all projects can afford this at an early stage. With this in mind, considering the requests we had received (including those from our commercial clients who wanted to gain access to our app on their mobile devices as soon as possible), we decided to make our control panel an adaptive one. We managed to complete the task with a minimum of expense by incorporating a vertical blocks design into our interface. We used Media Queries, ngTouch and matchmedia-ng. We’ve added the necessary styles and scenarios for all the key elements of the app, so now it works on almost all devices. In addition, thanks to the “vertical” display of information, it’s easier for our users to focus on a particular section they’re currently working on, regardless of the device they are using. In an effort to try and make our interface minimalistic but also a user-friendly one, we applied new patterns to the design, such as inline editing. Icons and pictograms make interaction much easier as people usually don’t like to read. This is how we solved the problem when some users couldn’t understand that what they saw was not static lettering but rather an input box: we combined easily recognizable icons with captions accompanying key elements of our system’s interface. Here is the input field which is easily understood by our users and not too “heavy” for our interface. In addition, we have changed UI of project settings in TrackDuck. We reviewed metrics, redesigned some of the unpopular options and also removed few the most seldom-used portion of our app’s functionality – all of this allowed us to focus on the features that provide user more value. Check your hypotheses and test new features constantly while developing a user-oriented product. You can avoid the majority of interface design mistakes while your project is still at the prototype stage. Regarding other issues, listen to what your users have to say; use your own product as often as possible; always try to critically reevaluate your experience. With this approach, you’ll create a great product, both you and your users will be proud of. We’d love to hear your Intercom story. Share yours with us by emailing stories@intercom.com.